What features are built into laboratory freezers to ensure that the temperature remains constant throughout the entire interior storage space? Unlike standard freezers used in homes or for non-laboratory or medical types of uses, warmer and colder sections of the interior a huge concern. 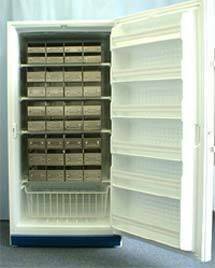 Laboratory freezers require standard temperatures throughout the entire freezer to ensure proper storage of specimens, samples and required chemicals and compounds. Slight variations in temperature can be devastating to the storage of these types of materials and supplies. Freezers that are rated for commercial laboratory use are designed and constructed with uniform cooling and constant temperature maintenance in mind. This includes the use of cutting edge insulation and design technology that limits the heat from the environment negatively impacting the performance of the cooling system. Increased insulation in the walls and doors of the laboratory freezer provides additional temperature control as does the specific technology used to maintain the internal temperature. Microprocessors are used to allow the cooling unit to adjust to any changes in the internal temperature of the freezer. The cooling is also completed using either evaporative cooling or convection type cooling that eliminates the need for fans or blowers that create colder locations within the freezer unit. Finally, each lab freezer is thoroughly tested prior to shipping. The unit will come with a pull down graph of the test at the manufacturer which provides all the information about that specific unit, not general manufacturer or style performance information. 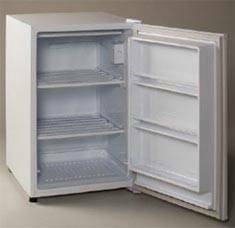 Do the freezers that mount under an existing counter require any specific clearance for air circulation around the unit and if so, how much? Most of the new models of under the counter freezers are designed to be set for standard size countertops of 34.5 inches. However, they can also be used as stand alone freezers and will sit nicely at the end of a counter or workstation and can be used to expand the storage area. The zero-clearance feature means that there is no requirement for a specific amount of space to be maintained around the unit to provide air circulation for efficient operation of the cooling unit. The standard height of a under the counter type of lab freezer is approximately 33.5 inches in height with a width of just under 22 inches and a depth of approximately 24 inches. This is all consistent with standard work stations, workbench or countertop measurements used in labs, clinical settings and medical facilities. How are laboratory freezers defrosted and what specialized equipment is needed? Since temperature control is essential for storage of medical materials, specimens and samples these freezers area all designed with a manual defrost. This ensure that a defrost cycle does not compromise or damage any samples that may be stored in the freezer. Defrosting requires no special equipment and should be done according to the manufacturer's guidelines that are sent in the product manual. If the manual is not available contacting the manufacturer directly or looking for information on their website is always the best option.